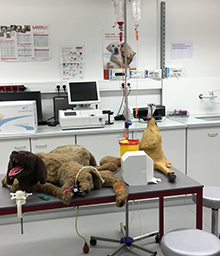 The clinical skills lab at the Veterinary Medicine University Vienna features many animal models for practicing things like physical exams and inserting catheters. The First International Camelid Congress in Vienna, Austria featured four speakers from Oregon, including Dr. Chris Cebra, Dean Sue Tornquist, and OSU alum Rachel Oxley. 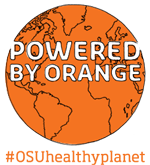 OSU has been a world leader in camelid research for thirty years. Dr. Cebra has written or co-authored over 70 scientific articles concerning camelids, and has been involved with over 40 camelid research projects. Nearly thirty camelid owners and sixty veterinarians attended the two-day conference at the Veterinary Medicine University Vienna. Camelids are becoming more popular in Austria, and the conference sought to broaden attendees knowledge of camelid medicine. OSU College of Veterinary Medicine currently has several animal models including those that allow students to listen to different heart or lung sounds, and models they can bandage or suture. “If we’re really going to do this right, we need to add more,” says Dr. Tornquist.